NEW! ** SECOND EDITION ** NEW! Paperback, 2nd Edition. Brichtmark, New York - Jan 2007. The author brings years of award-winning professional experience to this guide, providing the rules of engraving and the ways to realize them, producing publishing-quality music using the industry- standard software packages, Finale and Sibelius. He fully explains and demonstrates each step with hundreds of examples, tips, and quizzes. For this second edition, there is new information requested by readers, and updated information for the current versions of Finale and Sibelius. The first edition of this book won a Paul Revere Award for excellence in music graphics from the Music Publishers' Association. "...the Finale/Sibelius comparison is substantially updated to the current versions of the programs; Finale tips have been updated throughout and Sibelius tips have been added to balance the Finale tips; the index has been updated significantly; a short section on grace notes has been added; most of the screen shots (program windows) have been regenerated to match current versions of Finale and Sibelius." Music Library Association Notes (June 2003): "An essential book." American Guild of Organists The American Organist (October 2002):"You won't believe what you'll learn from any two pages." American Choral Directors Association Choral Journal (March 2004): "To produce professional-quality projects for your designers or publishers, Music Engraving Today is an indispensable resource." 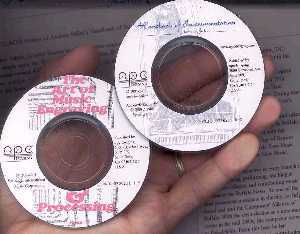 Also available bundled with our two CD-ROMs - see below. Our price: $34.50 + $10 shipping for first item, others $6 each. 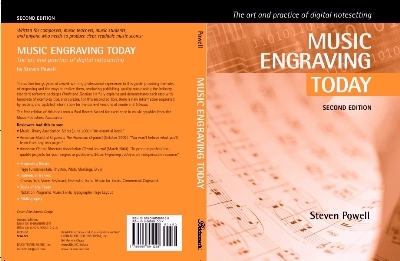 Get the second edition of Steve Powell's book, Music Engraving Today, bundled with the coolest music reference materials available - Andrew Stiller's Handbook of Instrumentation and The Art of Music Engraving and Processing by Ted Ross, on full-size or mini CD-ROMs. The 3" mini CD-ROMs can hold up to 180MB and play in all tray-loading drives that read standard sized CD-ROMs but you can now hold all 840 pages of music reference information in the palm of your hand! Our price: $88.95 + $10 shipping for first item, others $6 each.